2018 – Don't just rock it. Drama Rocket. This is your Flight Director, Katie Lindsay. I’m sorry, I know it’s been a while since we last communicated. This summer, Mission Control embarked on a very important quest in search of the bravest, most supercharged and stellar Crew. We think we’ve found them (check them out). Drama Rocketeers, we are now ready to embark on our Fall Mission and we hope you are coming with us! Space is limited at each school, so make sure you pre board (register here) as soon as possible so that you don’t miss out! Parents, I’m sure you’ve been wondering what your Drama Rocketeer will be doing on this mission. Rest assure that during our time together, your Rocketeer will have fun, make new friends and learn some acting skills that will enhance his/her self-confidence! The Drama Rocketeer Toolbox is essential for success in school, work and in life. Our Crew is dedicated to helping your Rocketeers soar! This is your Flight Director, signing off and saying, Don’t just rock it. Drama Rocket! 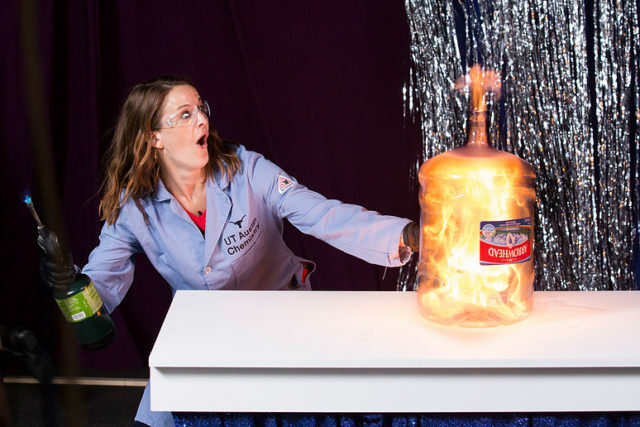 University of Texas Chemistry Professor, Kate Biberdorf, is igniting students interest in the field of science with her supercharged and explosive performances. Professor Kate Bi berdorf is currently a Lecturer (Professor of Instruction, beginning Sept 2018) and the Director of Demonstrations and Outreach for The University of Texas at Austin. She is particularly known for her explosive demonstrations that excite and awe her undergraduate chemistry students. Outside of the classroom, she also visits Austin city schools, promoting science education with her outreach program “Fun with Chemistry.” Dr. Biberdorf’s passion and enthusiasm for science is contagious. In fact, she has already made national headlines with appearances on NBC Nightly News, CNN’s Great Big Story and Amy Poehler’s Smart Girls, just to name a few. Dr. Biberdorf exudes self-confidence. Combined with her supercharged communication skills, this “Science Translator,” has the unique ability to entertain students and show them that science can be fun and exciting! Hmmm, Dr. Biberdorf sure sounds like a Drama Rocketeer to us! Obviously, our Drama Rocket Crew is beyond impressed with Dr. Biberdorf’s stellar resume! So, it’s no surprise that we made it our mission to find out how this Rock Star Chemist learned to Drama Rocket. What about the sciences first attracted you? We guess you saw something explode? Everybody asks me that because I’m such a pyromaniac now! My parents were always bothered by the number of questions I asked. WHY? What will happen? What’s next? They used to count how many questions I would ask on a car trip. I think they realized that science was a way to funnel my energy somewhere. They began letting me go in the bathroom with a big green bowl. The rule was that anything in the bathroom was safe and that I could use anything, combine anything like shampoos, bath bombs, etc. Food coloring was only allowed once because I think we were banned from ever using it again! Was there a specific experience that led you to the decision to study chemistry? It was during my sophomore year of high school. I had a fantastic high school chemistry teacher. She was exciting and fascinating and she would run around the classroom and light things on fire! I loved her passion for the science. She just changed my world for me. Does anyone in your family have a STEM background? No, a softer science, Psychology. I am definitely the black sheet of my family! 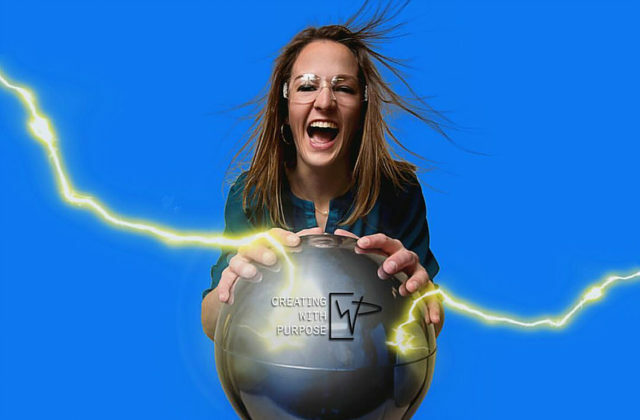 My mom, sister and dad are all psychologists, while I’m just over here in my lab blowing stuff up! Who encouraged or influenced you as a child? My parents. 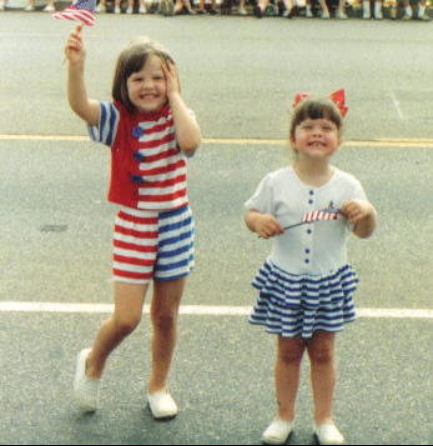 I’ve always had very strong role models. My mom is a strong fierce woman, so I’ve always known how to stand up for myself and how to be a strong woman. My dad is the kindest, most loving person in the history of men. 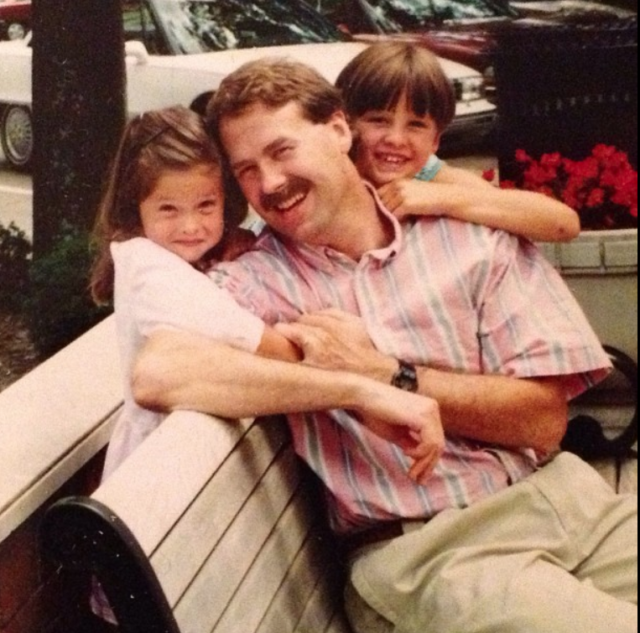 I’ve always been a Daddy’s girl and he has always encouraged me. He was at every single soccer game ever. We would travel nationally across the country and he was there. One of the most important things he ever taught me was the word, Try. Whether you win, lose or score a goal, you have to try. That has always been my motto in life. I try to be the best scientist, teacher, wife, etc. What extracurricular activities/interests did you have growing up? Growing up, I was always a jock and very athletic. I was very active, so if I was outside, I was always drawn to doing things physically, kinesthetically, because I like to use my body. I played soccer and was on the varsity team for four years. I actually made the Olympic Developmental Team. It was where my heart was. If I was out of school, I wanted to play soccer. When I was on the field I wanted to be the best soccer player I could possibly be, so I’d try my best. In the classroom, I wanted to use my brain as much as possible. I was in the top of my IB (International Baccalaureate) classes. I liked exploring things, I would say. I was great in science class because I really enjoyed what I was doing. You sound very driven. Were you always this way? Yes, always. My mom would say I was stubborn, but I say driven! My aunt says I was focused. At what age did you discover your dramatic/performer side? Growing up there were always four of us, two sets of sisters (two were my dad’s best friend’s daughters). We were always together and always performing! We would choreograph dances and make all of our parents watch. I didn’t realize it until about 6 months ago, but I really think that experience was part of all of this. I think I’ve been training for this my whole life! In the group, I’m third in age, and they always laughed, but I was the natural leader. When we were in college, we went on a camping trip and it was a nightmare! In the middle of the night, the tent fell down and it was storming. They all yelled, “Leader, Leader!” That was my signal to jump up and fix the tent, and it has just always been that way. I’ve always been someone who has had no problem leading. It’s part of my personality! But, as I’ve gotten older, I’ve also learned how to be a much better listener. You mention Bill Nye in several interviews. What do you specifically admire about him? He was FUN! When the teacher rolled out the television to watch an episode, I knew the next 30 minutes was going to be filled with fun information! Watching his show was when I received the best knowledge. I was able to hear about science from a real expert! Not to knock my elementary school teachers, but I’m sure they didn’t have an incredibly huge background on astrophysics. So, when Bill Nye would talk, it would just provide a different perspective. It was 30 minutes of AWESOME, that’s what I knew was going to happen! You seem incredibly comfortable standing in front of any type of crowd, no matter the size, age or education level. You’ve labeled yourself a “Performance Artist” and “Science Translator.” How do you mentally prepare for your performances? First, I am always prepared for a presentation. That alone makes me feel comfortable. In my persona it may look like I’m winging it, but that is all part of the presentation. Second, I train my extrovert side to come out. For me, that is listening to music before class starts, anything loud with a bass and a fast beat. It gets me and my students excited! What’s more challenging, lecturing to college students, or presenting to elementary school kids? To me they are equal. For elementary students, I have to tune down my science language. Sometimes that can be difficult, but if I don’t, then I will lose their interest because they can’t understand what I’m talking about. For college students, it’s all about making sure they don’t get bored, hence the blowing things up! It’s just about finding the perfect balance. You have stated that you know many of your students will not go on to be chemists, and that’s okay. You just want them to strive to be better people. What do you want them to learn from their time spent with you that will help them be better people? First I want them leave my class with new skills. For example, if they go to Europe, they need to understand how the metric system works! I want them to understand quantitative reasoning and be able to convert grams to kilograms, or even better take it to the molecular level! Second, I want them to be Global Citizens and to become informed voters. I want to express the importance of assessing information, looking at both sides of an issue and being able to determine if something is a good source or a bad source. I want to empower students to equip themselves with the knowledge of understanding bias news when reading things from both sides. What advice would you give students who plan to pursue careers in STEM? Never give up and keep asking questions. There will come a point in your lives, especially in an underrepresented community, where chances are a child will be told that a STEM job is not a possibility and that is just wrong. What are your thoughts on the recent transition from STEM to STEAM (A=Arts)? You appear to be the very personification of a STEAM Educator! I think it’s great! It’s neat that the arts are being introduced in science so early. I think Scientists struggle with communication and if we cannot explain our expertise, or communicate our findings and results, then there is a problem! If we can enhance communication skills, particularly in science, then we are all going to be better off. Our crew watched several of the videos on your website, www.katethechemist.com. We observed the following characteristics about you. You are extremely enthusiastic about your work; you exude self-confidence; you are a kid at heart; you possess excellent verbal and communication skills; you combine real life experience with concepts learned in class. Our guess is that you’ve known how to Drama Rocket for quite some time. In your own words, can you tell us you Drama Rocket? I Drama Rocket by applying what I know about Chemistry and sharing it with the world in a fun and engaging way. I want to inspire others to love science! There is nothing better than watching a kid’s expression when I blow something up! Continue to represent a differen t version of a scientist. I’d love to one day be a guest on CNN and talk about science! However, my true dream is to one day have my very own show in Vegas, on the scale of Brittney Spears or Celine Dion. Before that happens, there will need to be a big culture shift in the way we view scientists. I’ll be ready! All photos are courtesy of Dr. Kate Biberdorf and www.katethechemist.com. Hello, and welcome to Stellar News, the official Drama Rocket blog. 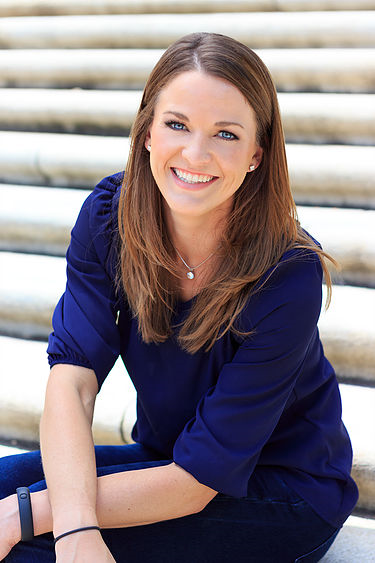 I’m Katie Lindsay, founder and “Flight Director” of Drama Rocket, LLC. Drama Rocket is an After-School Theatre Arts Enrichment Program for kids ages 4-12. Our mission is to help develop children through theatre arts by igniting creativity, supercharging self-confidence and boosting social skills. We aim to use drama as a tool to help develop future creators who will stand out as leaders among their peers and provide innovative solutions to problems that are facing our fast-changing world. brave dreamers into the world. Copyright by Drama Rocket, LLC. All Rights Reserved.